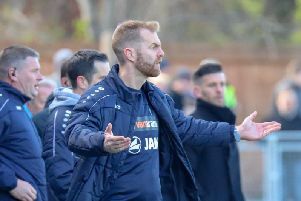 Harrogate Town manager Simon Weaver has demanded a response from his players, imploring them to prove their character as they host Kidderminster Harriers on Tuesday night. The men from the CNG Stadium were rocked by Saturday’s 3-2 defeat at FC United of Manchester, their second-half capitulation being of particular concern. After the club’s move to full-time status over the summer, boss Weaver has urged his charges to grasp their promotion opportunity. “I want to see a response from the team, from all of us,” he said ahead of the visit of National League North’s seventh-placed side. “It’s the first time we’ve had a few dodgy away results and people’s character comes into question. “I want to see who is really backing themselves and really wanting it. “We want people who will back themselves, not just miss out and then hopefully have another crack. John Eustace’s Kidderminster visit the CNG on a run of one defeat in 14 games - that coming against National League side AFC Fylde, who held former FA Cup winners Wigan on Friday. Successive away losses to physical sides Spennymoor Town and FC United have left Town 10 points off Salford City’s pace at the summit. While a return to their home ground’s 3G surface will doubtless relieve Weaver, he emphasised the need to stick to the basics against the Harriers. “They are a good footballing team,” he added. “They will have some corners, and if we can’t mark from them we’ll concede. “I think they’re a better footballing team than FC United, if we don’t deny them space to play we’re going to get hurt on both scores. Two faint positives from the Red Rebels reverse were a first start since October for Ben Parker and a first appearance since August for star striker Simon Ainge. Lloyd Kerry trained last week and is close to a first-team return, with Jack Emmett missing out on Saturday due to an arm injury. Weaver said: “We really missed Jack, his dynamic style, his pace and energy. “I’d play him with his arm in a sling, if the physio would allow me, because he lives and breathes it. Kick-off on Tuesday evening is 7.45pm at the CNG Stadium.